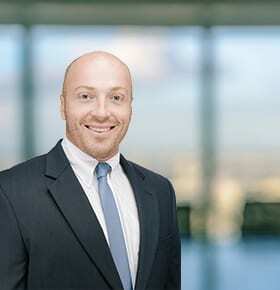 Greg Fay serves as a Systems and Analytics Consultant for the Feeney Law Firm. His background in engineering and finance provides cutting edge analytics for the firm. He is one of only 4500 Chartered Market Technicians (CMT) in the world and currently serves as a macro portfolio manager at his own firm. Greg served as the Director of Offline Media for a national personal injury firm prior to joining the Feeney Law Firm. Greg’s knowledge of the offline marketplace and proven marketing strategies helped the firm generate thousands of signed cases during his tenure. In his career he has coordinated hundreds of national TV, radio, email, print and direct mailer campaigns across a variety of case types including: mesothelioma and asbestos exposure, dangerous drugs, dangerous medical devices, work-related injuries, consumer fraud, and financial fraud. Greg also uses advanced analytics to keep costs low and case quality high for our clients. Greg has donated many hours of his free time to community service including: supporting children who have lost parents or close relatives, speaking to high school students about leadership and work ethic, dressing up as Santa Claus and delivering gifts to underprivileged families, making and serving food to homeless women, supporting cancer research, packing and loading 5,000 turkey dinners for hungry families during Thanksgiving, preparing taxes for low income families, and participating in revitalization projects for communities in need of repair.